I am always amazed by clouds. Especially in Netherlands where the weather is always cloudy, that seeing blue clear sky with sun, is a treasure. While returning from Istanbul from a conference and watching clouds float in the sky from the plane. I imagined about clouds, the science behind clouds, and a lot of other related things. I wrote some of those ideas on my plane napkin. 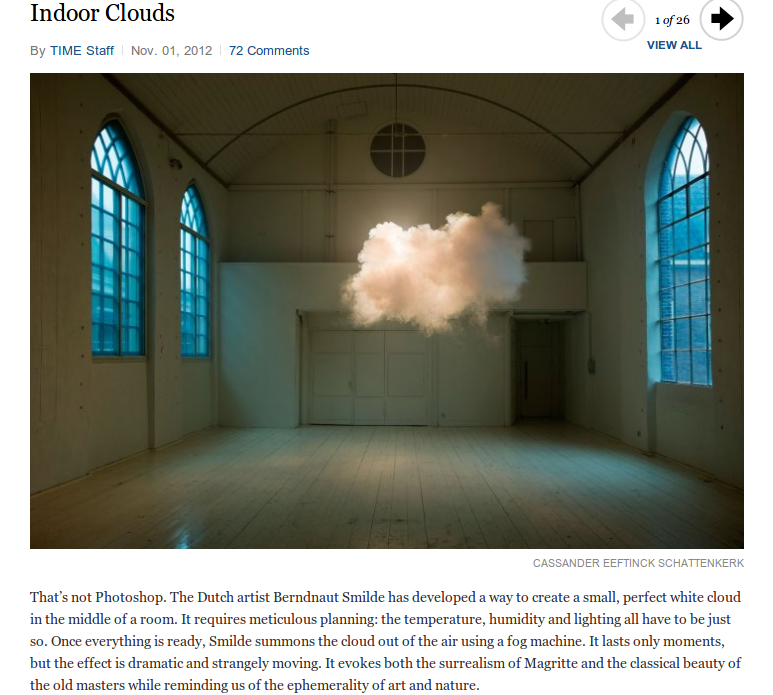 One of the prominent idea I imagined was, what if I can create decorative small clouds using some small machine (like a fog machine) in my own room.. Will it be possible? What opportunities lie in such an idea. For example, lets say, there is a children's birth day party and I want to simulate a room filled with clouds instead of Baloons. What would it take to make clouds in a room? Can I make thunderstorms happen in those clouds artificially? Some wild creative imaginations. Today I was delighted to see the exact thing I thought counted amongst one of the best inventions by Time in 2012. Here is a picture. I do not know the authenticity of the claim below. The feeling that I get ideas which are worthy is fine to feel happy :-).